The Sony Xperia Z1 boasts a unique Exmor RS sensor, custom built for the latest flagship. It's the highest resolution available on an Android smartphone (beating the Samsung Galaxy S4 Zoom). It's a relatively large 1/2.3" sensor too, which should make a big difference in terms of noise performance and dynamic range. What's beyond us is the fact that in Superior Auto mode the Sony Xperia Z1 shoots stills of only up to 3840 x 2160 pixels (read 8.3MP) as on previous smartphones, which had only 13MP cameras. It's only in Manual mode where the resolution jumps to 5248 x 3936 pixels (20.7MP). We'll talk about the multiple shooting modes later on. The Xperia Z1 uses a wide-angle (27mm) Sony G Lens camera with a bright F/2.0 aperture and a BIONZ image processor. Sony has literally equipped the Xperia Z1 with all the latest tech they have on tap, and that's just the hardware, the Xperia Z1 is very impressive on the software end, too. The camera interface consists of two panes. The right one holds four virtual buttons - a shortcut to the gallery, shutter keys for the camcorder and the still camera, and a front/rear camera toggle. On the left side you get the shooting mode selection key in the top corner, followed by three shortcuts. The final shortcut here opens the drawer with all the extended settings for the given shooting mode. 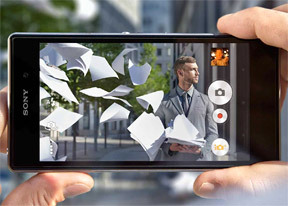 Naturally, the Sony Xperia Z1 camera offers a plethora of built-in features, including face detection, smile shutter, geotagging, touch capture (with Burst option) and an HDR mode. There's also the home-baked quick launch mode, which lets you select what the camera does once you press the dedicated camera shutter button when the phone is locked or in standby. You can go for simply launching the camera in either still or camcorder mode, or you can set it to immediately snap a photo/start capturing video. This might come in handy for those occasions when you just can't afford to miss a shot. There are all kinds of shooting modes on the Sony Xperia Z1 aside from the Superior Auto. On the Xperia Z1 Sony has replaced the Normal shooting mode with Manual (in an obvious move to mathc the Nokia Lumia 1020). Also gone is Burst mode, now dubbed Timeshift burst. It captures 61 shots in just 2 seconds and the intriguing thing is it starts shooting even before you've pressed the shutter button. Other modes include the regular Picture effect mode, Sweep panorama and you can also get fancy with the Augmented Reality effect. It paints a virtual world over your scene and can be quite entertaining (we'll take a look at it later on). Sony has also included a mode called Social streaming, which can live-stream the video feed from your camera directly on your Facebook profile. That's certainly not something you see everyday. Finally, in a Goggle-esque twist, the Xperia Z1 has a feature called Info-Eye that can recognize text, business cards, QR and barcodes, landmarks, bottles of wine and even book covers, too. Sony has partnered with leading companies in the respective fields to provide info (e.g. Amazon for books, Vino for wines, etc.). In our short text sample it worked quite well. Sony has utilized the Google Now card design to show relevant information for what you're looking for. In the ex-Normal/now-turned-Manual mode you can actually set all settings to Auto (it hardly gets more confusing than that), but remember that Manual is just a marketing name, the more proper name would be Normal mode, which they used before. The difference between the Superior auto mode and the Manual mode when everything is set to Auto is that the Superior Auto tries to guess what kind of a scene you are trying to capture and adjusts all image parameters accordingly. This includes color saturation, contrast, metering mode. The auto setting in Manual mode only sets the exposure automatically, but lets you fiddle manually with the other settings if you want to. But you can have them set to Auto if you prefer. The good news is the Superior auto mode also tells you what it guessed so you can easily intervene if it gets it wrong. Our experience so far shows it gets things right almost every time. We've compiled a bunch of samples from the Sony Xperia Z1 camera for your viewing pleasure. The first two batches are taken in normal mode, read 20.7 MP, while the third is captured via the Superior auto mode in 8.3MP. We won't be passing any judgments on the camera quality just yet. Now, here are the same scenes shot in Superior auto mode. As we mentioned, the resolution of the photos is 8.3MP.